Upmarket feel. Decent value. Flexible HSS configuration. Could use a tougher setup. Launched in 2012, the Select series is the top tier of Fender's standard production ranges before you enter Custom Shop realms. For 2013, a selection of new models were added: a carved top Jazzmaster, HH and Thinline Teles, and new versions of the Carved Blackwood Top Telecaster and the Strat HSS, reviewed here. It's easy to dismiss this Select as simply an upmarket 'posh' Fender. Yes, the Strat has a thin maple top, barely 3mm in thickness, but by design it aims to fit in style between the American Vintage and Deluxe ranges. 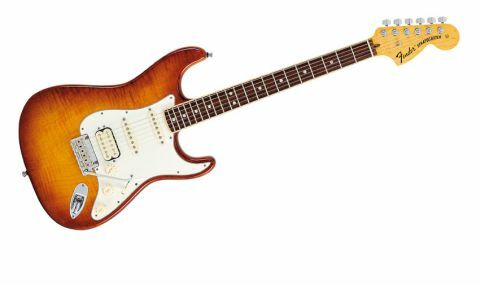 "It's a vintage/posh collision if you like, centring on top-quality woods but without the garish colours"
The 2012 Strat HSS features a standard 22-fret birdseye maple neck with compound radius fingerboard and small Fender headstock. This year, while the compound radius is retained, the head moves into larger 70s style and we're introduced to the 'channel bound' neck - a new twist on a bound 'board. Instead of a strip of plastic or wood laminated to the fingerboard edge (and hiding the slots cut in the fingerboard to accept the fret tangs), Fender has 'inlaid' the rosewood fingerboard into the oil-finished maple neck. This leaves an edge-of-the-neck material, around 2.8 to 3mm wide on either edge and across the curved fingerboard end, trimming the fret count to 21. The frets sit full-width across the 'board and binding, so there's no difference in feel. The neck has slightly rounded fingerboard edges that help create a played-in feel. As with the 2012 Select, we're hardly spoilt for colour options - there's only one. The figuring of the Strat's thin maple top is relatively subtle. Hardware remains the same on the 2013 Select with the Strat's two-post floating vibrato (with tapered steel block), as used on non-vintage higher-end Fenders. There are also vintage-style bent-steel saddles. "Fender says in 'split' mode, it creates 'single-coil tone with hum cancellation'"
Again, we get the rear-locking dual-height tuners, the bottom three strings have standard height posts, and those for the top three have shorter posts, increasing the strings' back angle behind the nut. The plastic parts are subtly colour-aged, too. The Strat retains the Twin-Head humbucking pickup, designed specifically for this series, plus two Select single coils with a vintage stagger to the magnetic pole pieces. In position two on the five-way (bridge and middle pickups), the 'bucker is automatically split, voicing the screw-coil, while the two tones affect neck (tone 1), and middle and bridge (tone 2). However, there's no mention in the specs of the S-1 style push-switch in the top of the volume control's heavily knurled knob, which audibly splits the neck-placed Wide Range Special humbucker. Fender says in 'split' mode, it creates "single-coil tone with hum cancellation". There's little not to like about this Strat if you're after single-coil spank but still need the comfort of the bridge humbucker for more mainstream rock sounds. It's a slightly 'hot vintage' output (9.72k ohms), with plenty of midrange thickness and a rounded high end that's almost the polar opposite of the stinging highs, lower output and more open midrange of the single coils. "The raw balance of the middle pickup is still a favourite for this writer"
As you move through the pickup options, position two's split bridge and middle cleans up your amp nicely. The raw balance of the middle pickup is still a favourite for this writer - a perfect sound to track parts recorded with a humbucker. Position four has funk aplenty, while the solo neck single coil is nicely balanced with a lower-mid thickness and colour that adds a little beef. It might not wash with the vintage Strato-philes, but it has plenty of vintage vibe to its expanded tones, as well as the feel of that oil-finished neck. Aside from a couple of issues - it would benefit from a tougher setup - this is a highly enjoyable guitar that broadens the original's visual and tonal reference points without going too upmarket in looks.